With the first signs of spring comes the most popular holiday in Israel: Easter. Every year, thousands of visitors travel to Israel to spend a memorable Easter in Israel’s holy and historic sites. The crowds and options can be overwhelming. Therefore, we’ve created the ultimate guide for you to get the most out of your once-in-a-lifetime experience of Easter in Israel. Read on to find out where to go on your trip, as well as information about all the 2019 Easter events. In 2019, the fun begins on April 14th, which is Palm Sunday. On this day, many Christians head up the Mount of Olives in Jerusalem. They do this to recreate Jesus’s entrance to the holy city of Jerusalem. Next, you’ll proceed through the iconic streets of Old Jerusalem and join the procession that goes down the Via Dolorosa. On the way, you’ll pass some beautiful sites, such as Saint Anne Church and Steven’s Gate. You can choose to either take part in this amazing procession, or join the onlookers lining the sides of the streets. Whatever you choose, this is sure to be an unforgettable experience! 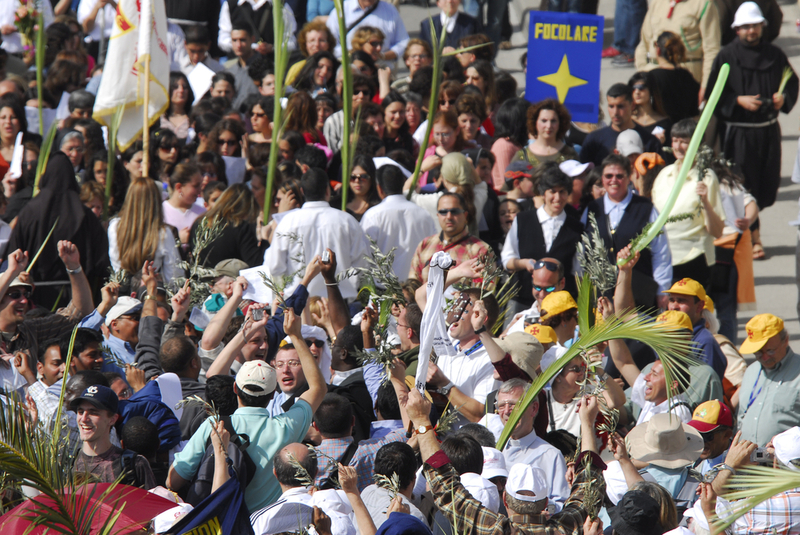 There is definitely no better way to kickstart your Easter in Israel trip than Palm Sunday in the Old City of Jerusalem. 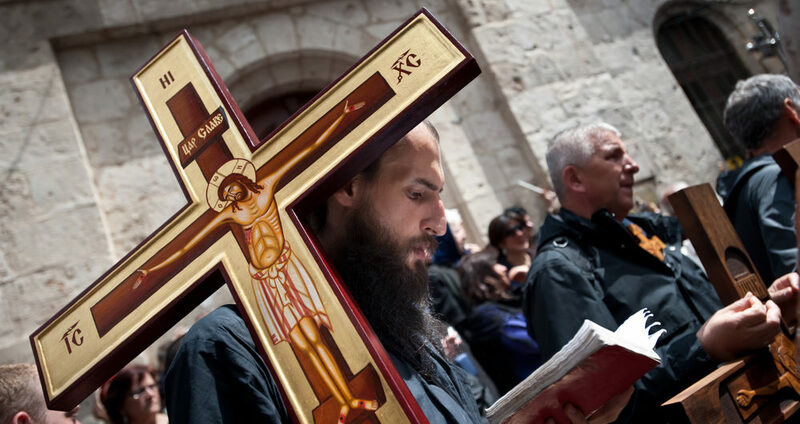 Over the next week until Good Friday, there are daily masses happening at a few locations in Jerusalem, including the Church of the Holy Sepulchre and the Garden of Gethsemane church. Discover our expert tips for traveling in Israel to make the most out of your Easter in Israel experience! If you’re here for Easter in Israel, then celebrating Good Friday is a given. This year, it falls on April 19th (which is also the same date as the Jewish holiday of Passover). 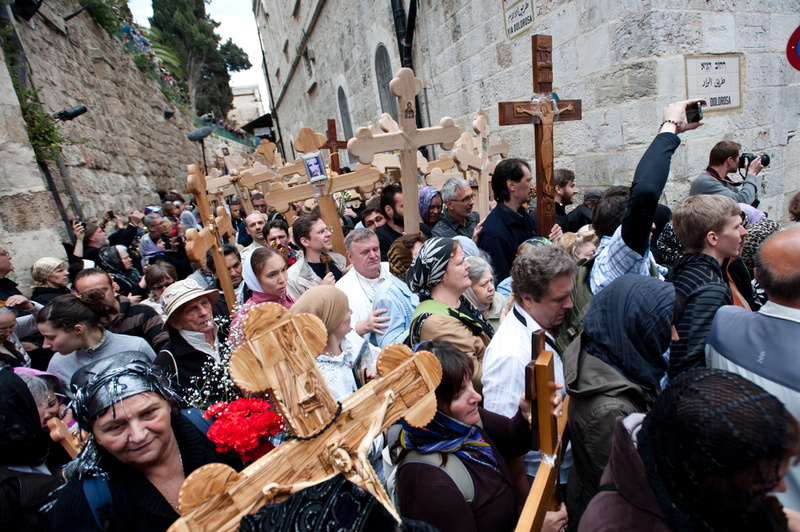 Good Friday will also see tons of visitors lining the streets of Jerusalem. Many visit the Old City to recreate the pilgrimage of Jesus’s journey to be crucified. The Way of the Cross procession will begin around noon. However, be sure to arrive to Jerusalem with plenty of time, as there will be massive crowds who all want to be a part of the amazing procession. Pilgrims will head down the Via Dolorosa, and many of them will carry crosses on their backs to symbolize Christ’s walk to his crucification. Looking for ideas on where to spend next Christmas in Israel? See our roundup of Christmas events here! On Holy Saturday, huge crowds of Christian pilgrims go to the Church of the Holy Sepulchre in Jerusalem. You can also go witness the incredible Holy Fire annual miracle. 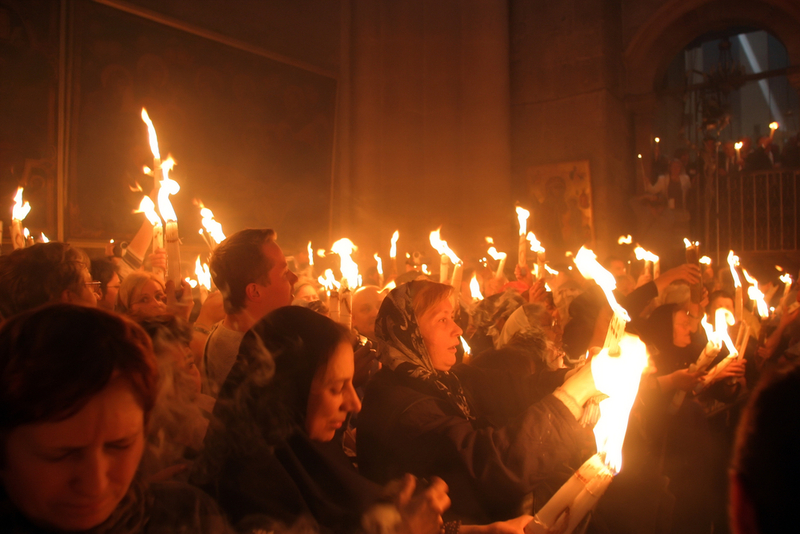 The Holy Fire starts as two candles lit by the Patriarch of Jerusalem over Jesus’s tomb. He prays and uses these two candles to light the candles of other pilgrims. The light gets passed around from pilgrim to pilgrim, until every candle is lit. It is said that the Holy Fire does not burn, and you can often witness many pilgrims waving their hands through the flames (though we do advise caution). On Saturday, you’ll also find an Armenian parade, consisting of a marching band with drums, bagpipes, and procession to the Church of the Holy Sepulchre. There is also an English sunrise service at The Evangelical Lutheran Church. Palm Sunday, Good Friday, and Holy Saturday are the main events. However, on Easter Sunday and Easter Monday, there are further processions and masses at the Church of the Holy Sepulchre. After you’ve experienced a traditional Easter in Israel, there are still tons of other holy Christian sites for you to explore! Stick around for a few days and visit the towns of Bethlehem and Nazareth. Furthermore, you can also enjoy the natural sites of the Holy Land with a visit to the Sea of Galilee, the Negev desert, and the Dead Sea. Contact us for help in planning your perfect Easter in Israel tour. Leave the planning to the experts and we’ll make sure you don’t miss out on any part of this important holiday!